Global demand for industrial and institutional (I&I) cleaning chemicals is projected to expand 3.7% per year to $50.3 billion in 2021, stimulated by gains in personal incomes in developing countries, increased spending in the healthcare sector globally, and the recovery of the foodservice sector following declines in several major markets. Disinfectants and sanitizers will provide strong opportunities for I&I cleaning chemicals due to their use in a wide range of applications – from healthcare to foodservice and food and beverage processing. 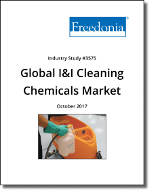 This study analyzes the global market for industrial and institutional cleaning chemicals. For the purposes of this study, the term “I&I cleaning chemicals” describes chemicals used in cleaning products designed for use in the commercial, manufacturing, institutional, and government markets. Demand for I&I cleaning chemicals is examined by product type, market, and region in US dollars at the manufacturers’ level. Historical data for 2006, 2011, and 2016 and forecasts to 2021 are presented in current US dollars (which are not adjusted to account for inflation).